Unlike innate immune response, which remain essentially unchanged upon exposure to a recurrent challenge with the same stimulus, adaptive immune cells possess the ability to learn and remember. Adaptive immunity relies on the capacity of immune cells to distinguish between the body’s own cells and unwanted invaders. Healthy cells present peptides from normal cellular proteins on their cell surface, and lymphocytes will not be activated in response to them. When a cell is infected by viruses or other pathogens, the foreign peptides generated are recognized by lymphocytes that are activated and destroy the infected cell. Viruses employ different strategies to inhibit presentation of viral-derived peptides. One way consists of the modulation of proteasome activity which generate the peptides from full-length proteins. Some viruses also directly interact with and inhibit the machinery responsible for the generation and transport of loaded MHC molecules. 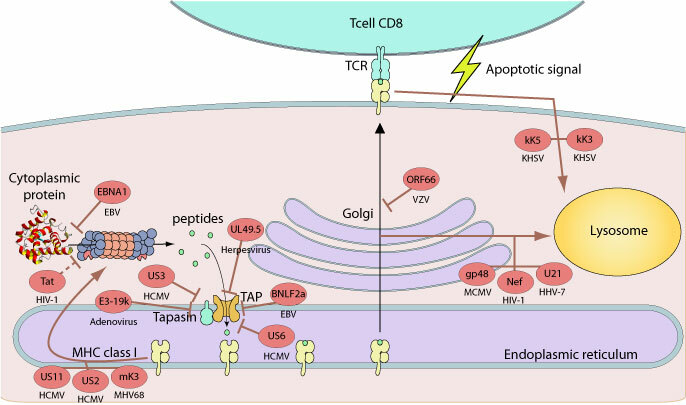 For instance, TAP and tapasin are common targets of viral proteins.